been measurable, along with manganese, which was detected in many of the samples. Lower-acceleration voltages were used when probing individual spores, significantly reducing the X-ray absorption and fluorescence effects of the sample mount material, primarily silicon, revealing more representative concentration count ratios for carbon, nitrogen, and oxygen in the individual spores. Quantitative chemical analysis was performed using a standardless ZAF routine that models and subtracts background counts, calculating elemental concentrations from the remaining X-ray peaks. As the program is intended for working with infinitely thick bulk samples rather than micron-size particles, the quantitative results can only be realistically used as comparative quantities between individual spores, the matrix material, and the octahedral crystals. Precise concentrations would be difficult to determine, as electron probe depth and X-ray excitation volume at 6 keV is greater than the average spore size of 0.8 microns in diameter and 1.5 microns in length, assuming a spore density similar to that of elemental carbon. The EDX spectra easily confirmed the presence of silica in samples where it had been added as a flow enhancer. In addition, EDX analysis helped provide the identity of certain microcrystals observed in a few samples, as shown in Figure 13.2. 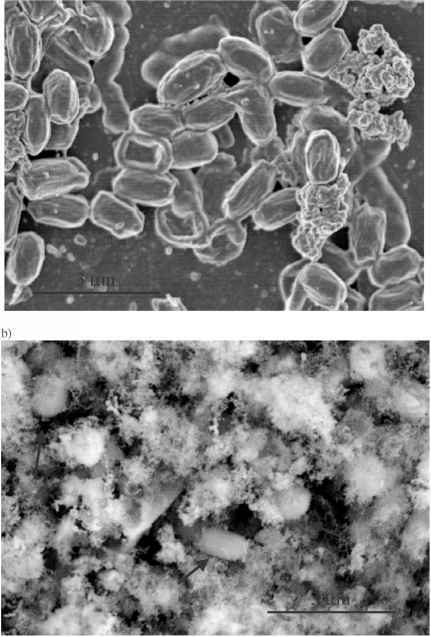 An SEM micrograph of a representative crystal is given in Figure 13.2a with its concomitant elemental composition shown in Figure 13.2b. Note the fairly square morphology of the crystal (~10 |lm X 10 |lm X 2 |lm) and its high concentrations of magnesium and phosphorus. In addition, carbon, nitrogen, sodium, potassium, and calcium were also found to be present in the crystal. 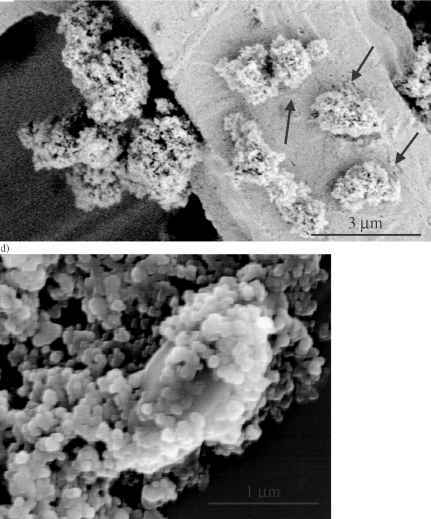 These microcrystal results are in sharp contrast to the octahedral protein toxin crystals generated by B. thuringiensis, shown for comparison in Figures 13.2c (SEM micrograph) and 13.2d (elemental composition). The crystals of bacterial origin are much smaller (~1 |lm in length), and contain only carbon, nitrogen, and oxygen (the silicon is from the substrate). Since the microcrystals were observed only in samples that had been grown in a medium containing very high concentrations of magnesium and phosphate, it was surmised that they were primarily magnesium phosphate that had precipitated out of the medium during processing of the spores. In addition to this microcrystal example, other elemental signatures of various growth and processing steps including sodium, magnesium, aluminum, phosphorus, sulfur, potassium, and calcium were also identified.